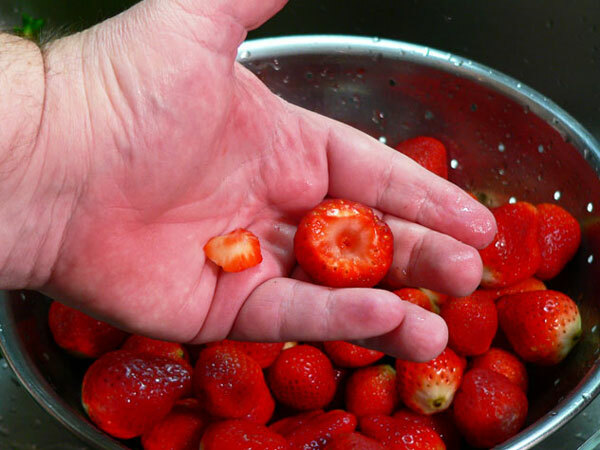 Follow step-by-step, photo illustrated instructions for making our Strawberry Syrup. 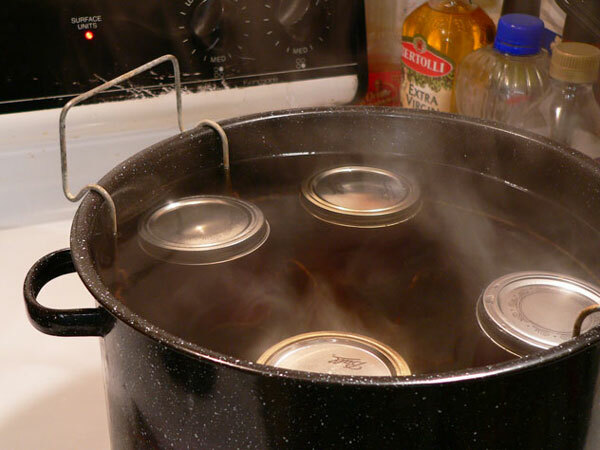 We’ll also show you how to can it using a water bath canning process that’s simple, easy and fun. Saving Summer In A Jar is a great way to enjoy the great taste of Strawberries throughout the year. Use this syrup on pancakes, pound cake, or your favorite Ice Cream. You’re going to love it. Printable recipe included. Spring has finally arrived and things are getting busier at the North Carolina State Farmers Market in Raleigh. The faithful few farmers that manage booths all year long, will soon be sharing the 30,000 square foot Farmer’s Building with more of their farming friends, and a larger variety of products to select from. And, the best part of all, is that all the items offered for sale in the Farmer’s Building must be grown right here in the state of North Carolina. Shopping a local Farmer’s Market not only allows you to source the freshest fruits and vegetables, it also supports the many family farms, and new upcoming farms, that exist throughout the state. You’ll love your visit, I guarantee it. Many vendors offer free samples, and of course they are a wealth of knowledge and information on how to prepare and enjoy the items they sell. Winter hasn’t wanted to let go this year, so it was still a pretty cool day when I made a return visit to the Raleigh market a few days back. Fresh winter greens still dominated the market, but some of my favorite sights of spring were on display. That would be Strawberries of course. There’s just something about fresh local Strawberries that says, “Winter is finally over,” in my book. Even though I can’t get out in the pick-your-own fields and get them any longer, I know I’ll find all I need and then some, at the market. Just walking down the aisle and seeing those bright red berries on full display brings a big old smile to my face. Most of the farmers will offer you free samples of the berries, as they’re all proud of what they’ve grown. There’s even an Official Strawberry Day held each year at the market with all kinds of samples, the Strawberry Queen, and much more. It’s always free to the public, and they offer many other special events as well, like Blueberry Day, Watermelon Day, and more. You’ll find a list of all the events at the Raleigh Farmers Market website if you’re interested and anywhere close by. I’ve been seeing Strawberries at the market for some time, and was eager to pick some up for this recipe. 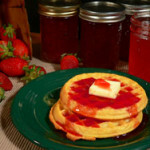 Strawberry Syrup is really easy to make and a great way to “Save Summer In A Jar,” when you can and jar them at home. The syrup is great as a topping on Ice Cream, on pancakes and waffles, or drizzled over a big slice of pound cake. 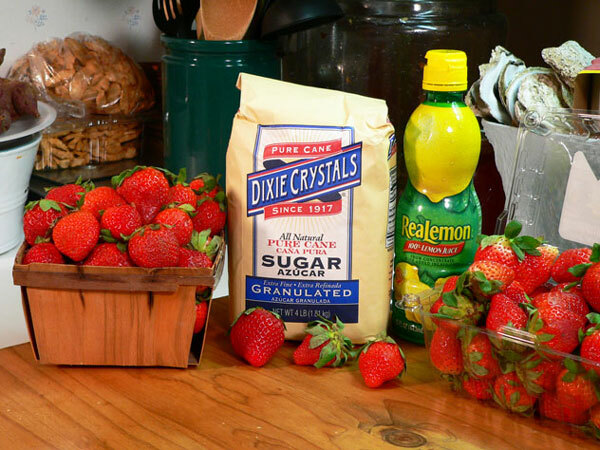 Stir some into a glass of club soda for a sparkling Strawberry beverage, or make your own Strawberry Milkshakes at home. You’ll find lots of great uses for it once you’ve made up a few jars. 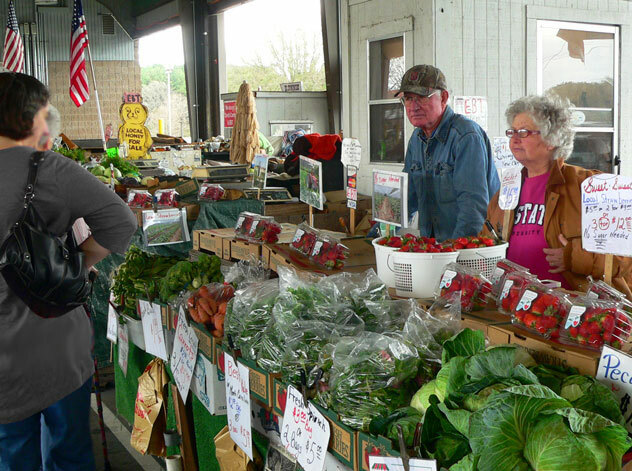 You’ll find some of the nicest farmers around at our North Carolina markets. They’ve always been eager to share ideas on how to prepare the fruits and vegetables they sell, so don’t be shy when you visit. Many live and maintain farms that have been in their family for generations. They work hard at what they do, but you can always tell that they love it, and love sharing it with you the customer. I’ll introduce you to a couple of just such folks in a moment. 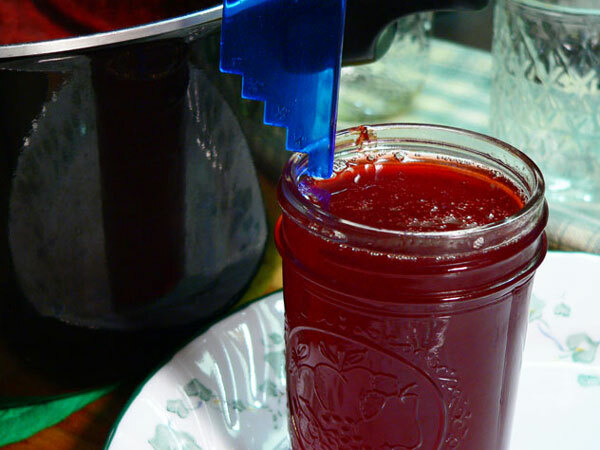 So, if you’re ready to kick off another year of canning and preserving, or just thinking about trying it for the very first time, I hope this recipe will help. Ready to get going? Alright then… Let’s Get Cooking! William and Helen Wise, of Wise Farms out of Mt. Olive North Carolina, readily share free samples of their homegrown Strawberries with a couple of customers visiting the North Carolina State Farmers Market in Raleigh. Many of the farmers hand out free samples throughout the year. Everything from Strawberries, Blueberries, Peaches, Apples, Cantaloupe, Watermelon, Salsa and more are available for tasting as you stroll through the market. 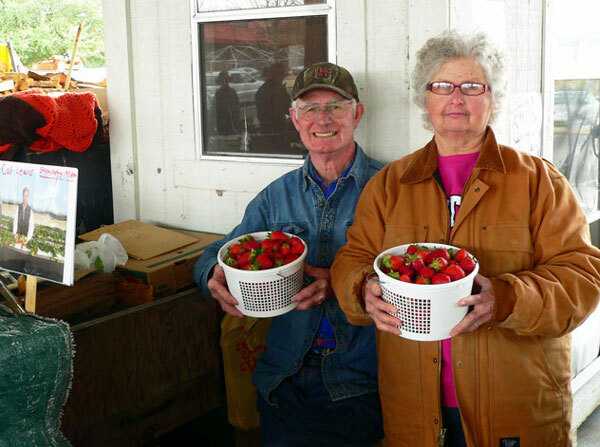 Here, Helen and William Wise, proudly display buckets of fresh ripe Strawberries available at their booth. Helen told me they had been selling Strawberries at market since October of last year from the “tunnel” type greenhouses they’re grown in. I was eager to turn one of these buckets of berries into some sweet Strawberry Syrup. Be sure to visit the Wise Farms booth when you shop the Farmers Market and online at www.wise-farms.com. They’re just one of many farmers that sell throughout the year at the Raleigh Farmers Market. Ask them to show you the pictures of the family while you’re there. I took this picture on Strawberry Day 2014 at the NC State Farmers Market. This was a week or two later than the pictures above of the Wise Farm booth and their strawberries. 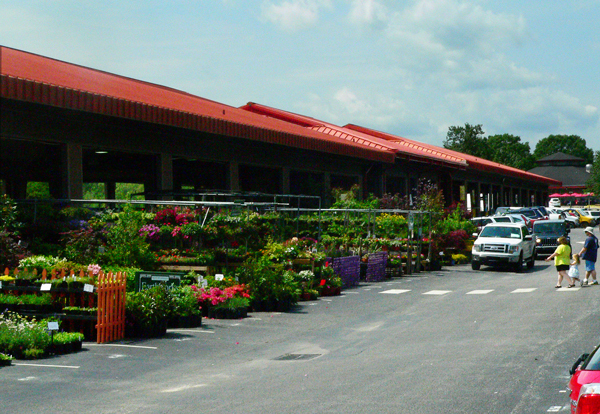 As you can see, flowers, plants and shrubs were in abundance by now. 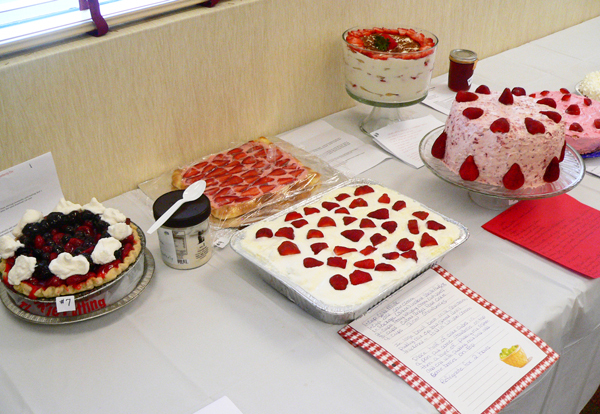 I was there for the Strawberry Day Dessert Contest and entered one of the very jars from this batch of Strawberry Syrup. I wanted to enter a Strawberry-Pecan Cake in the contest, but time just didn’t allow for me to get it ready. So, wanting to visit the market anyway, I decided to enter a jar of this Strawberry Syrup. If you look real hard, you can see my lonely little jar of syrup back behind some of the cakes and pies that had been entered. When I saw all these gorgeous looking desserts, I almost turned around and left. I did manage to hold my head up high though as I entered my Strawberry Syrup in the contest. Then, I had to wait around for about two hours until the actual winners were announced. That was okay though, as it gave me plenty of time for a very nice breakfast at the State Farmer’s Market Restaurant. This is just a part of the folks that attended Strawberry Day at the market. 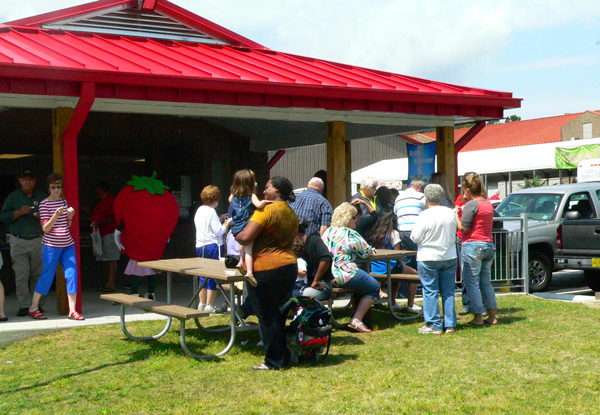 It was a beautiful Spring day with folks enjoying free Strawberry Ice Cream, locally grown fresh Strawberries, free recipes, and a special appearance with Suzy the Strawberry, who just wasn’t looking my way at the time I snapped this photo. This is where the officials came to announce the winners of the dessert contest. I was a bit surprised when they called my name out as a SECOND PLACE WINNER in the Dessert Contest. I think they had about 18-20 entries, all pies and cakes, but my little jar of syrup did me proud. I picked up $75.00 in cash, a State Farmers Market Tote Bag, and some other goodies. So, it turned out to be a really fun day. Thank You to everyone that participated and to the event sponsors for their support. 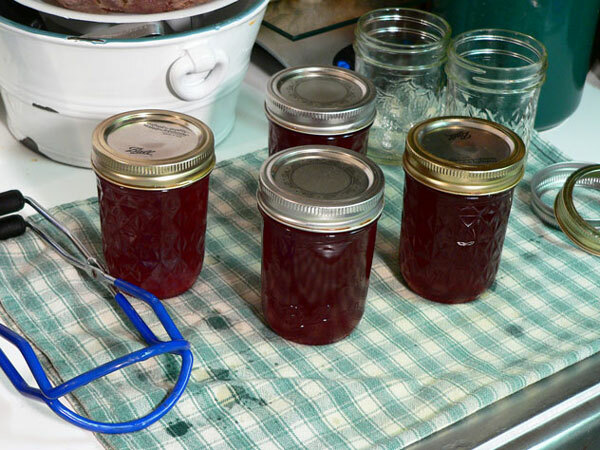 OK, let’s get on with showing you how you can make your own Prize Winning Strawberry Syrup. 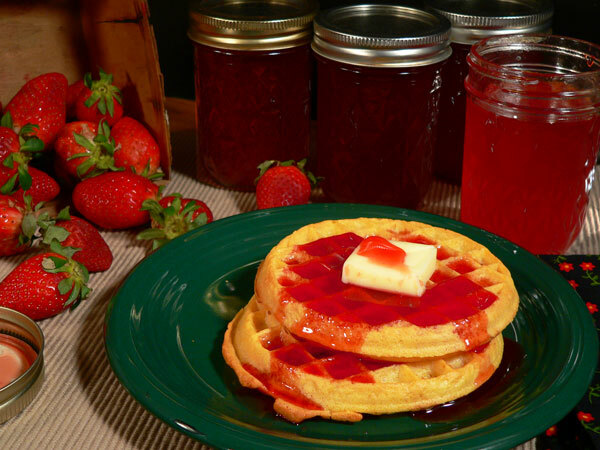 Award Winning Strawberry Syrup: You’ll need these ingredients. Start by gently rinsing the berries under cold running water. 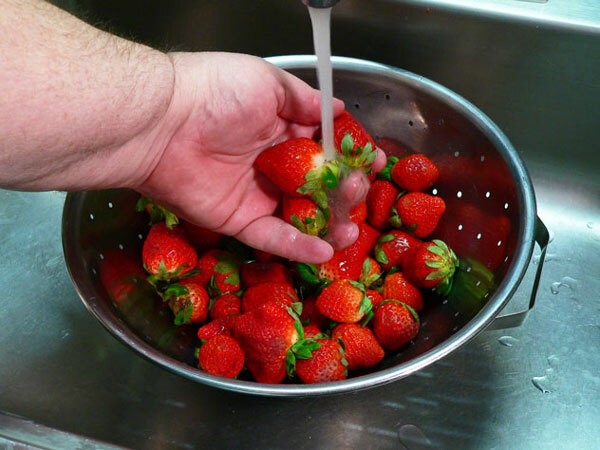 It’s best to rinse the Strawberries individually, lightly rubbing them between your fingers to remove any dirt and excess seeds, as opposed to just filling the sink with water and dumping them all together. The experts say any bacteria on the berries is transmitted more readily from one berry to another if they’re all floating in a sink of water together. It doesn’t take as long as you might think to rinse them separately. You can find various kitchen gadgets made for removing the hulls and stems. I just pull the caps off after I’ve rinsed them. Then, I take a paring knife and cut out the stems. Insert the knife into the berry at a slight angle, then just work it around the stem to remove it. With the berries all cleaned, it’s time to get everything setup for the canning process. Place the berries in a large bowl and chop them up a bit. These were a little too firm to just mash up, so a quick chop will help break them up. Next, add the Lemon Juice. Strawberries, like most fruits, contain a good amount of natural acid on their own. Adding the Lemon Juice brings the level up enough to ensure you can safely can them in a water bath canner. It will also help enhance the flavor. Stir the berries up really good. 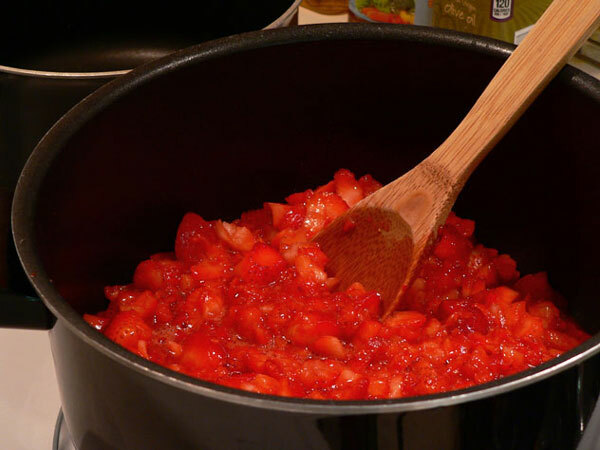 Place the berries in a good size sauce pan, and place it over Medium-high heat on your stove top. Let the berries come to a slight boil, stirring constantly, to prevent them from sticking to the bottom, and scorching or burning. 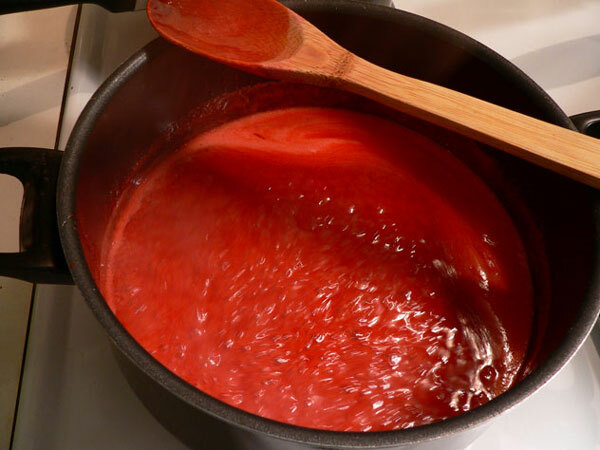 Once the berries have reached a light boil, REDUCE the heat and let them simmer until soft. This will take about 5 to 10 minutes on average. Once the berries are softened, you can mash them a bit to release as much juice from them as possible. 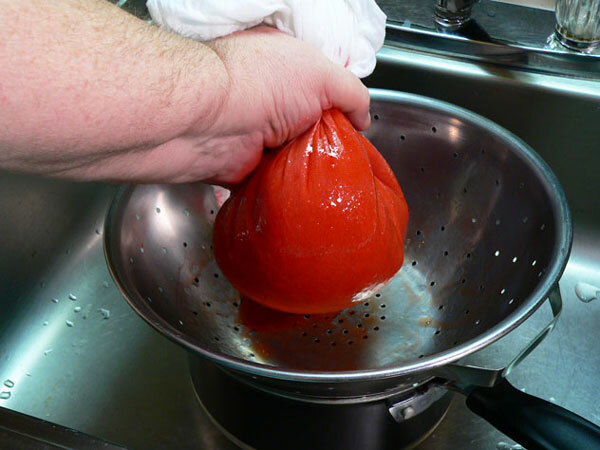 You could use a jelly bag, if you have one, to strain the juice from the berries. Cheesecloth, or some type of sieve would also work. 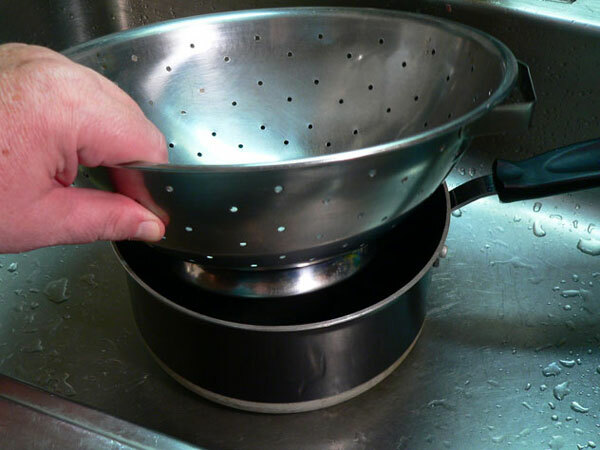 Here, I’m placing my colander over a medium size sauce pot, and I’ll use this to catch the juice. 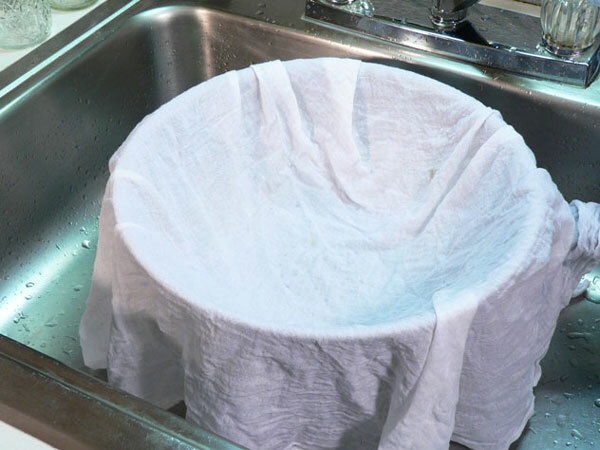 A couple of layers of cheesecloth will work great, or just use a clean white cloth. This is a flour sack dish towel that I’m using. It’s draped over the colander and the sauce pot. The mesh of the cloth is a bit tight, but it will catch all of the seeds from the berries. 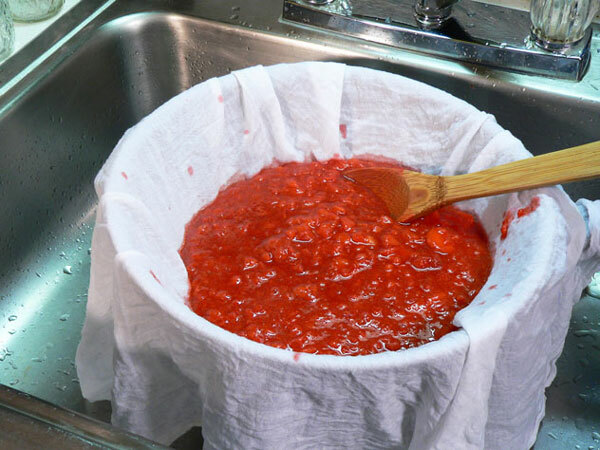 Place the berries in the cloth and just let them sit and drain while they cool. If you’re using cheesecloth, you’ll need a couple of layers folded together to try and catch most of the seeds. 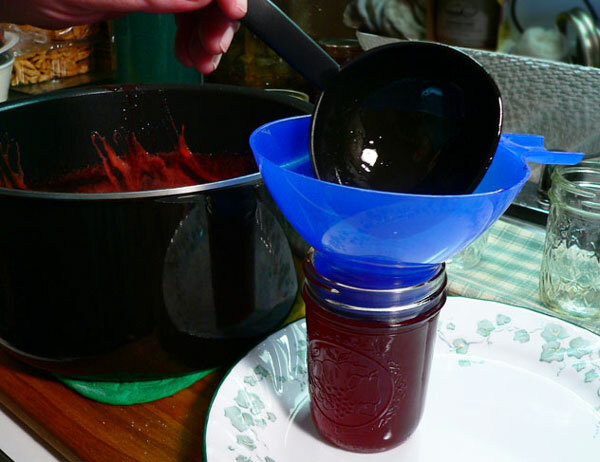 This is one of the older methods of straining the juice from the berries. If you have one, a juicer would probably yield a bit more juice than this process and would work just as well. After they had cooled, I folded up the edges of the cloth around the berries and slowly began squeezing out as much juice as possible. I must admit, this took a little extra effort and was a bit tiring on the fingers. Just continue to work out as much juice as you can. You’ll need to measure the amount of juice you get from the Strawberries. Regular season berries will probably yield more juice because the berries are allowed to ripen a bit more on the vine before they’re picked. I had acquired three cups of juice from three pints of Strawberries. It was a little less than I had expected, but the great thing about this type of recipe is that its pretty adjustable. You just need to know how much juice you have before you start adding sugar. Measure it carefully, make note of how much you have, then set the juice aside while you prepare the jars. You’ll need to wash your jars in hot soapy water. 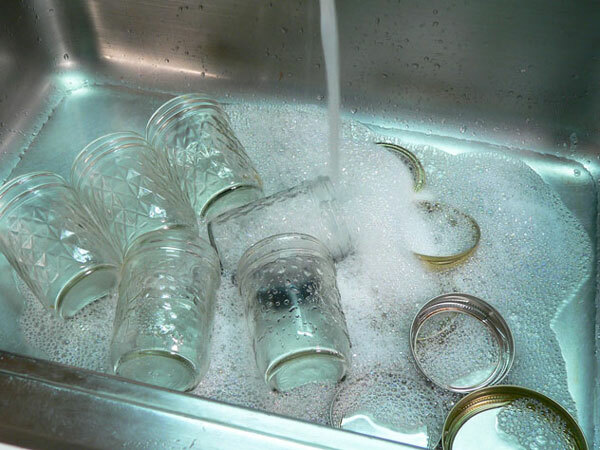 You’ll also want to wash the bands, so throw them in the sink with the jars. You’ll be using NEW jar lids, so no need to wash those. You also need to check the jars at this time to be sure they don’t have any chips, nicks or cracks in them. Any jars that have chips should be set aside for other projects. A chip in the rim could prevent the jar from sealing properly, so don’t use those if you find any. 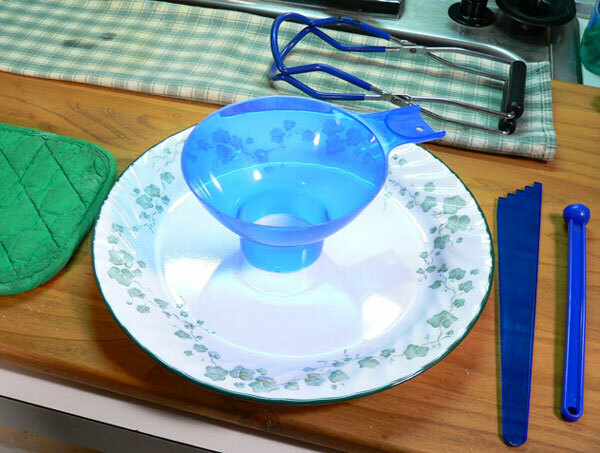 You should also wash your funnel and any other tools you’ll be working with. Once washed, rinse everything and sit it on a clean cloth or towel. As mentioned, you MUST ALWAYS use NEW jar lids when canning. 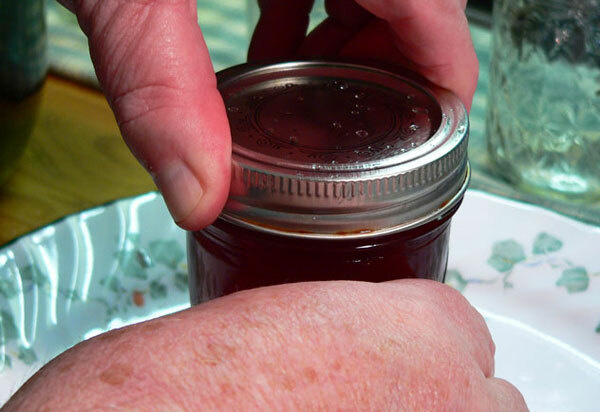 The bands and jars can be used over and over, but never try to seal a jar with a used lid. 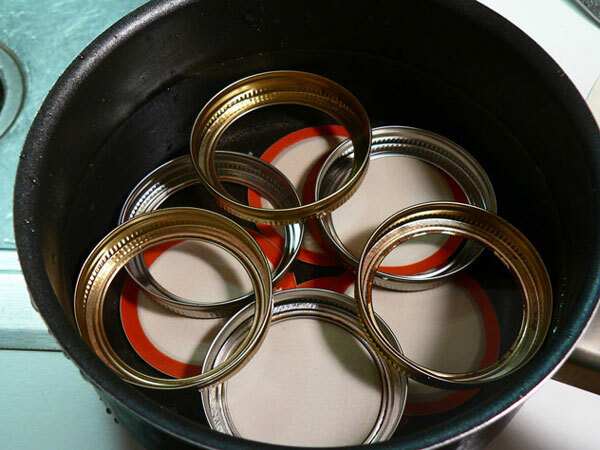 Place the new jar lids, and the washed bands, in a small sauce pot about half full of water. I always try to spread the lids out on the bottom of the pan so they’re not stacking up on top of each other. This pot will be placed over the lowest heat setting on my stove top. 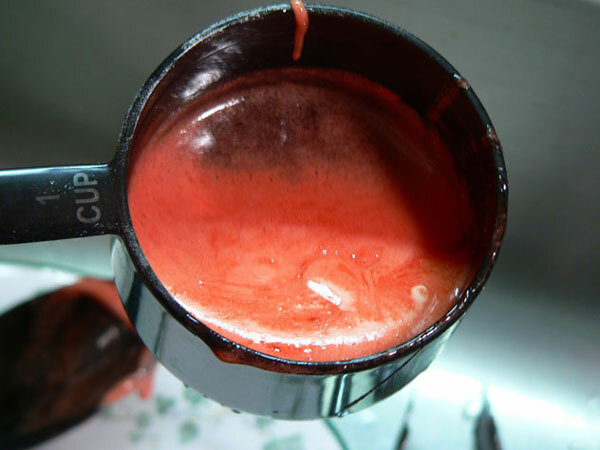 The lids need to be warmed to help soften that red sealing material once it comes in contact with the rim of the jar. Lids should never be allowed to reach the boiling point as it could damage them. I always start them warming about the same time I start warming the water for sterilizing my jars. This has become my “standard setup” for canning. The pot on the back-left burner holds the bands and lids while they are warming up. 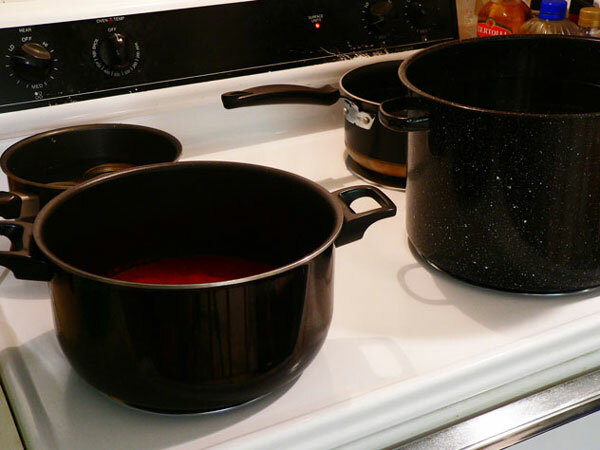 The larger pot on the back-right, is just filled with water that is being heated up. I can use this hot water as needed to refill the larger water bath canning pot you see on the front-right of the stove. On the front-left is another large sauce pot where I keep the food product I’m preparing to can. The canning pot itself, is made of enameled metal and comes in a couple of different sizes. This is a smaller one since I’m using half-pint jars today. I have a larger one for quart jars that is also deeper. The canning pot is filled with water almost to the top. I place the washed and rinsed jars in this pot and let them boil for at least 15 minutes to sterilize them. You’ll also want to go ahead and setup the area where you will be filling the jars. I arrange mine this way, another standard I’ve become accustomed to working with. The folded towel at the top of the photo is where I’ll place my sterilized jars once I pull them out of the boiling water in the large canning pot. I have a pot holder on the left to place the pot with the juice once it’s ready. The plate is where I place my jars as I fill them, it just makes clean up easier. The jar lifter, bubble remover tool and lid lifter are all set and ready for when everything all starts happening at one time. 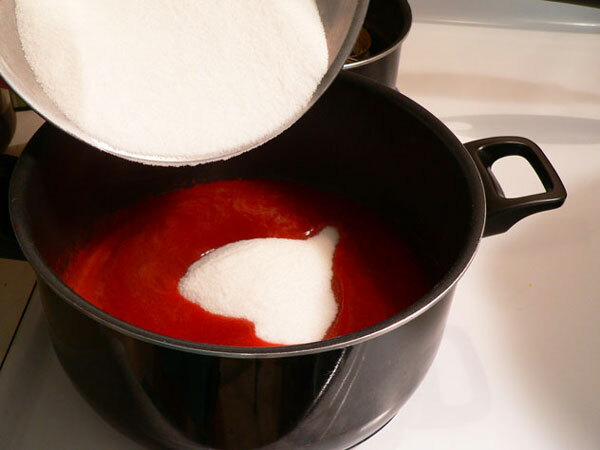 Now, measure out the amount of sugar you’ll need to make the Strawberry Syrup. This particular recipe will allow you to adjust the amount of sugar used depending on whether you want regular syrup or one with less sugar. The printed recipe includes a standard measurement for 4-1/2 to 5 cups of juice. Since I only had 3 cups of juice, I’m having to adjust the recipe to fit. I’m going with a ratio of one cup sugar to one cup juice plus 1/2 cup more sugar. I could cut the amount of sugar used in half if desired and still get a favorable result. All recipes are not this flexible, so keep that in mind if you’re just beginning to preserve foods at home. Once the jars have boiled for 15 minutes, they’re ready to be filled. Just leave them in the boiling water while you prepare the juice and sugar. Stir the sugar into the juice and continue to stir the pot while it heats up to a rolling boil. You really can’t walk away from the pot at this point. Just keep stirring the pot so the mixture doesn’t stick to the bottom, scorch, or burn. Let the juice come to a rolling boil. Once it reaches the rolling boil, stop stirring and just let the mixture simmer for ONE minute. Immediately remove it from heat and place it on your hot pad. Let it sit for a minute or two, then remove any foam that might be on top. Skimming off any foam will give you a much better presentation in the finished product. Use a spoon to skim off the foam and then discard it. This part can be a little tedious, but it’s well worth the effort and time to get as much of it as you can. 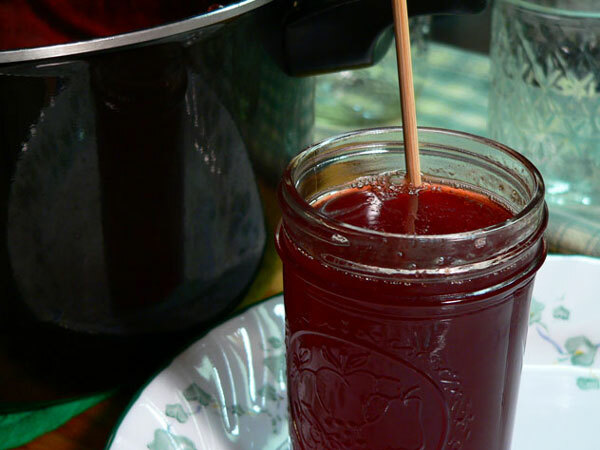 Remove one or two of the sterilized jars from the water in the canning pot. I slide the plate right up next to the juice pot to catch any spills while I fill the jars. 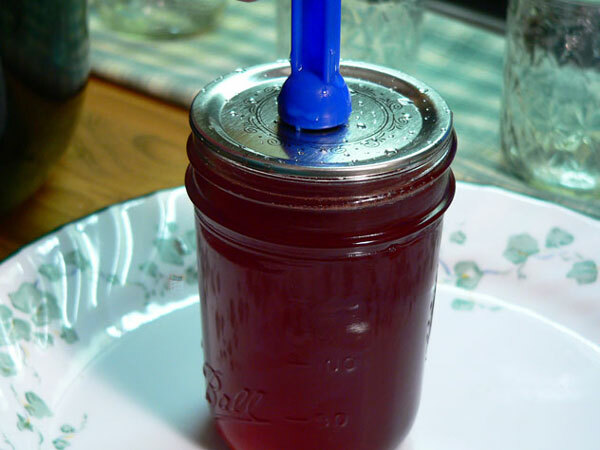 Use the funnel and a ladle to place the syrup into the jar. I will typically use a wooden skewer to try and remove any air bubbles from the jar. Most canning kits usually come with a tool that lets you check the head space in the jars with one end, and remove air bubbles with the other end. I’ll show you that in the next step below. Just run the tool around the inside edges of the jar and down through the middle. Any trapped air bubbles should ride the tool to the top of the jar where they will burst, or where you can burst them. While bubbles aren’t really a problem in this recipe, it can be a bigger issue in some other types of recipes. You need to remove as many of the air bubbles as you can. The notched end of this tool lets you measure the proper amount of head space needed for this particular recipe. Head space is the amount of space between the top of the product in the jar and the top of the jar rim itself. The amount of space that should remain open will vary depending on the particular recipe used. Always consult the recipe for what is needed. Proper head space will allow the jar to seal properly. We’re leaving 1/4 inch in these jars, as indicated by the first notch on the tool. When the jar is properly filled, take a damp cloth or towel and wipe any food particles from the top of the jar and the threads around the top of the jar. 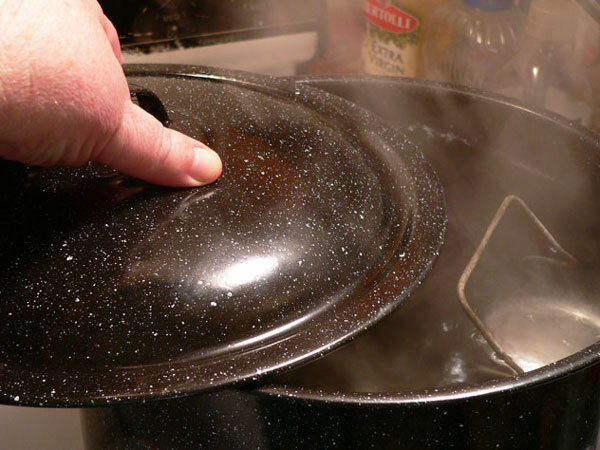 The top rim needs to be clear of any food particles that might keep the lid from fitting properly and resulting in it not sealing. 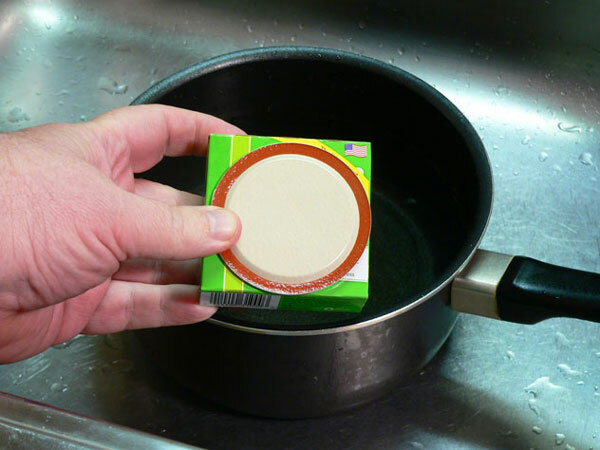 Use the magnetic tip of the lid lifter tool to remove one of the lids from the warm water. Center the lid on top of the jar. You don’t have to be concerned about any water on the lid at this point. The lid lifter tool is also used to remove one of the bands from the water. Carefully apply the band and screw it down, making sure it’s going on properly. With the band on the jar, tighten the band “finger tight.” This means you’re just snugging the band to the jar without exerting any extra pressure to tighten it down on top. As the jars are filled, place them back in the canning pot. If your pot is like mine, it has a rack that holds the jars. The rack has two handles that have curved sections in them. These sections are hooked over the top of the canning pot while you’re adding the jars. This particular rack will hold up to 7 jars at one time. Since I only have 4 jars, I placed them at opposite sides of the pot to balance out the pot as opposed to stacking them so close together. Carefully lift up on the handles and lower the whole rack down into the pot. 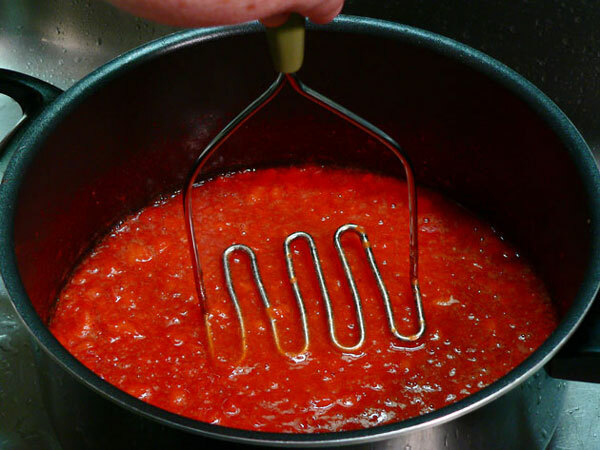 If a jar should tilt over, use the jar lifter, or some tongs, and sit it back upright. The jars need to be covered with about two inches of water. This is where that extra water that I’ve now got boiling on the back burner comes in handy. I can pour it into the canner and it will come back up to a boil pretty quickly. 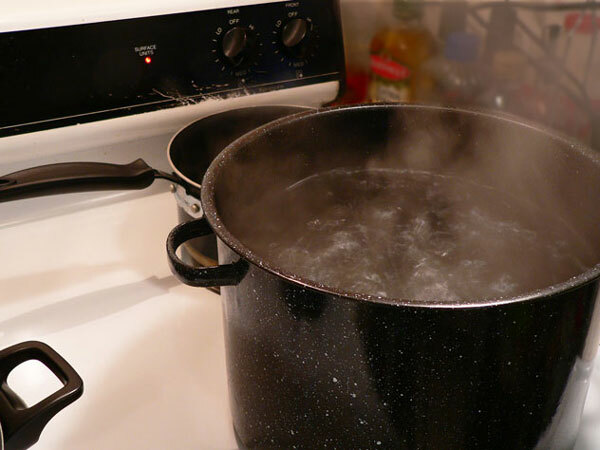 When the water comes back up to a boil, cover the canning pot with its lid. Start timing the water bath process at this point. 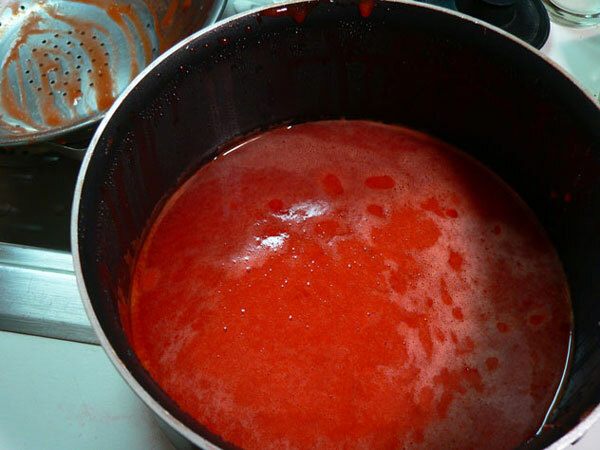 The Strawberry Syrup needs to undergo a 10 minute water bath. The time starts once the water has come back up to a rolling boil and you’ve placed the lid on the canning point. Actual processing time for the water bath will vary depending on the Altitude of your location, see the chart below. 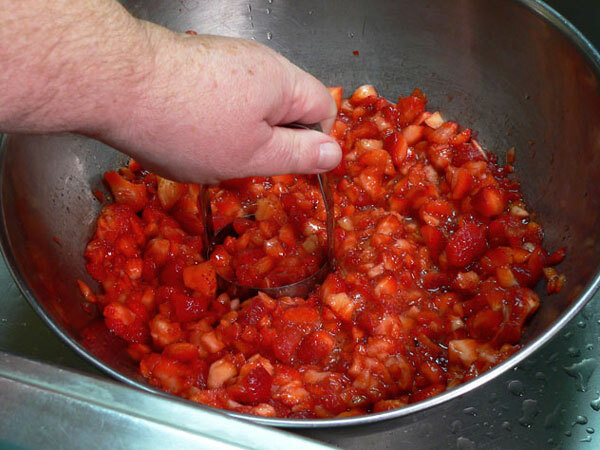 Adjust the amount of time needed to water bath process your Strawberry Syrup according to these times. When the proper amount of time has gone by, raise the rack back up and hook it back on the rim of the canning pot. The jars need to just sit here for about 5 minutes before you remove them. I always use tongs to raise the rack. Just remember that water is HOT, so be careful. Again, if a jar tilts over, just sit it back up straight. You might even hear a jar “ping” as it seals during this time. After 5 minutes, use the jar lifter and remove the jars from the rack and water. Keep the jar upright as you move it. Place the jars on a folded towel in a draft free location. Do not place the jars directly on your counter top, especially a granite or marble type top. The jars are hot and placing them on a cold counter could cause them to burst. Give the jars plenty of space and just let them stay in this spot for 24 hours undisturbed. This is the fun part, as you start counting the “ping” sound the jars make as they seal. Resist the urge to press down on the center of the jar lid until the 24 hours have passed. If you don’t hear all the jars make that ping sound, don’t fret it. The jars may still have sealed. Just wait the 24 hours then press down on the center of each lid. If the center button springs up and down, the jar is not sealed. You should place that jar in the refrigerator and use it first, it’s still good. If the button remains down, the jar is properly sealed and can be safely stored for up to one year in a dark and cool location. It’s best to remove the band from the jar before you store them. This will prevent the bands from rusting and sticking, making them difficult to remove. Also, place the jars on one row and do not stack anything directly on top of them. Removing the bands can also help you later in finding any jars that might have lost their seal after a period of time. It happens occasionally, and that food will need to be disposed of properly. By removing the band, the lid can raise up if it loses it seal and you’ll be able to find it easily. The same thing applies by not sitting the jars on top of each other. 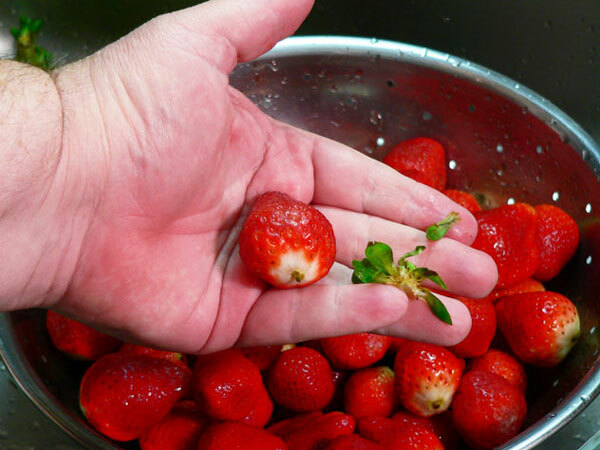 Follow step-by-step, photo illustrated instructions for making Strawberry Syrup. 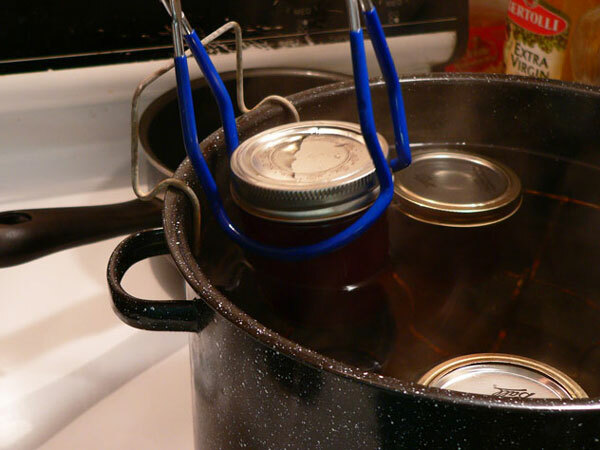 We’ll also show you how to can it using a water bath canning process that’s simple, easy and fun. Saving Summer In A Jar is a great way to enjoy the great taste of Strawberries throughout the year. Use this syrup on pancakes, pound cake, or your favorite Ice Cream. You’re going to love it. Gently rinse the berries under cold running water. Remove the caps and stems. Place the berries in a large mixing bowl and mash them well. Add the lemon juice, stir well. Place mashed berries in a medium sauce pot, over medium-high heat, and bring to a boil. REDUCE heat and let simmer until soft, about 5-10 minutes, stirring constantly. Place colander over a sauce pot. Drape with clean white cotton cloth. 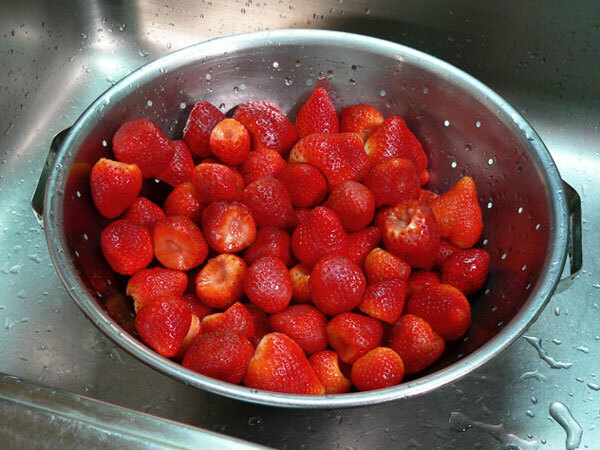 Pour the strawberries in the strainer, let drain until cool. Squeeze as much juice as possible from the berries. Set aside for now. 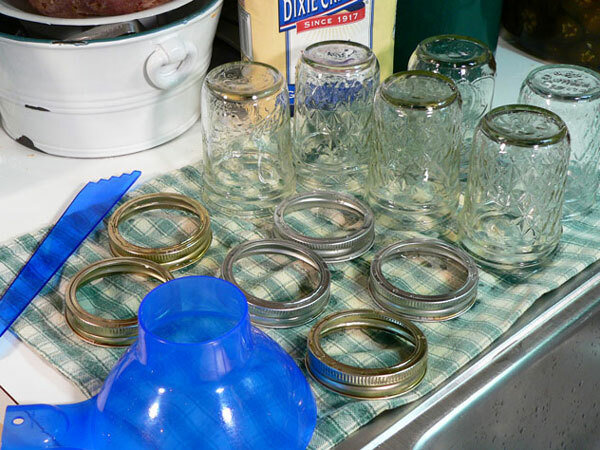 Wash jars and bands in hot soapy water, rinse well. 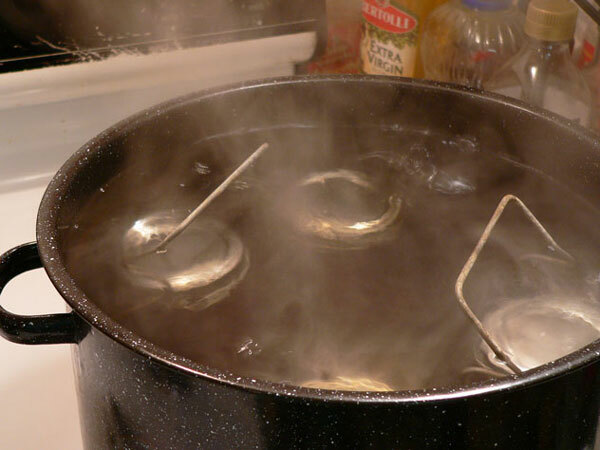 Place jars in boiling water, let boil for 15 minutes to sterilize. Place smaller sauce pot, half filled with water, over lowest heat setting on stove top. Add the bands and NEW lids to the water, let stay until ready to seal jars. Prepare your canning station, have everything needed on hand and ready. Measure the amount of berry juice produced. You should have 4½ to 5 cups of liquid. 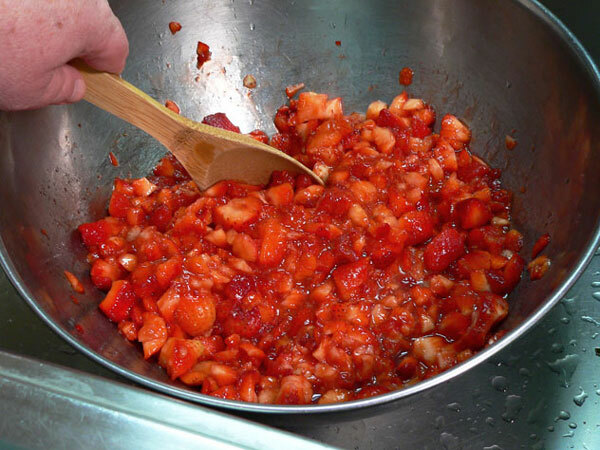 Place juice in large sauce pot. Adjust the sugar to juice ratio as desired for your own personal tastes. 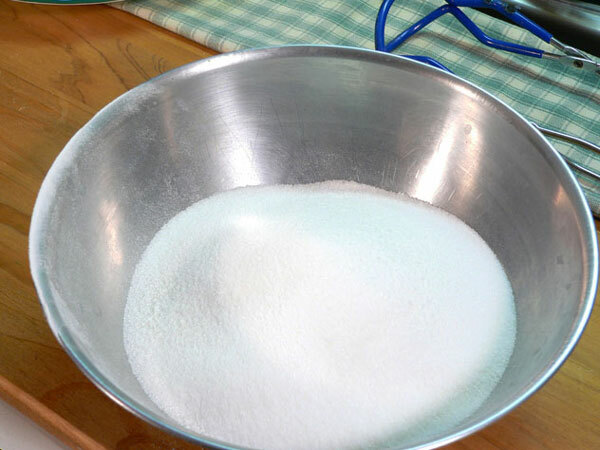 Add sugar, stir mixture constantly to prevent burning and sticking. Bring mixture to a boil, let simmer at this point for ONE minute. Remove jars from hot water, set on towel. 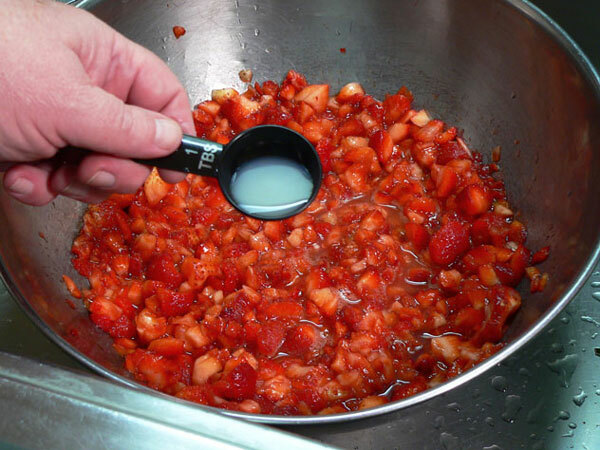 Using a ladle and funnel, fill jars, leaving ¼ inch head space. 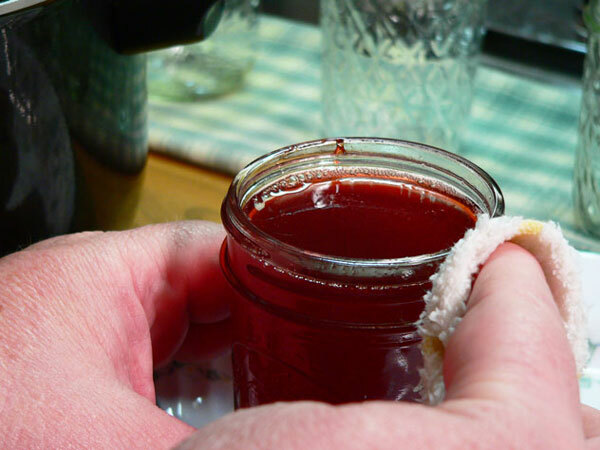 Using a damp cloth, wipe the tops and threads of the jar, cleaning well. Lift one lid from water and center on top of jar. Lift one band from water, place on jar, tighten only finger tight. Repeat this process until all jars are filled. 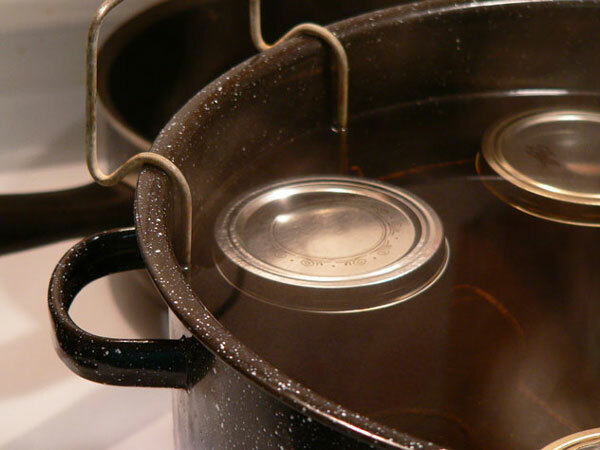 Place sealed jars in canning rack of water bath canner. Lower the filled rack into the water. Water must cover the jar tops by about 1-2 inches at all times. Bring back to a boil, cover the canning pot. Start timing the canning process. Process the jars based on the proper altitude time for your area. When processed, raise the rack and let rest on rim of canner for five minutes. Carefully lift the jars, place on a folded towel in a draft free area, undisturbed for 24 hours. Resist the urge to press the tops of the jars for a full 24 hours. Enjoy the “ping” sound as your jars seal. If the button on the lid remains down, jars are properly sealed. Any jars that did not seal may be refrigerated and used first. Store jars in a cool dark area for up to one year. Your Comments: Have you ever made Strawberry Syrup? Is this your first attempt at using the water bath process for home food preservation? I’d love to hear your comments about our recipe. It will only take a minute or two to share your thoughts with us in the Comment section below. Just keep in mind that all comments are moderated. This just means that I personally read each and every one of them before it’s approved for our family friendly home here on the Internet. Your comment will not appear right away, but I promise that I’ll get to it just as soon as possible. I also try to reply to all comments so be sure to check back shortly for my reply. Thank you for sharing your comments with us. If you try our recipes, please come back and share your results with us. It might convince someone else to try it as well. Sign Up For Our FREE Newsletter: Each week I send out a quick Email to let you know when we’ve posted a new recipe here on Taste of Southern. I’ll also keep you informed of our latest Contests and Giveaways, and any thing else that might be going on around Taste of Southern. It’s a great way to keep up to date and it’s totally FREE of charge. All you have to do is enter the requested information in the Sign Up box below, or the one you’ll find in the top right hand corner of each page of our site. Registration is super easy and quick, and should you ever decide that you’re just no longer interested, it’s even easier to unsubscribe. So, be sure to sign up while you’re here and I’ll be looking for you on our list. Thank You in advance for your support. I hope you’ll share our information with you family and friends as well. I’d greatly appreciate it. Hi there! I just tried your recipe tonight for the first time. It is still going through it’s last bath but I licked the spoon after filling the jars… it’s delicious!! I am relatively new to canning, having only made jams with Certo powder so this is my first experience with real canning. I was a little overwhelmed reading the directions at first but after reading them a few times, I felt confident that I could do this. The only glitch I had was that I only got about 3 cups of juice from my 7 cups of berries. 90% of the berries I used were very ripe local berries and then I had to supplement with store bought berries as I ran out of the good ones. Anyway, I would normally be terrified that changing a canning recipe would possibly affect my canning outcome but since I read that the amount of sugar could be varied for your preference, I used 60% of the sugar since I only had 60% of the juice. Anyway, great recipe, thank you! I am sure this is not the only time I will make this one!! I have a small patch of strawberries that should be ripe the 1st week of June and I am certainly going to try making syrup recipe. Sounds delious. We are really enjoying the nice weather after the unusual cold and snowy winter just past and looking forward to more good things from our small garden. Hi Steve. I have a small patch of strawberries that should be ripe the first week of June and I am going to make your syrup recipe. Sounds delious. We are really enjoing the nice weather after the unusual cold and snowy winter just past and looking forward to more good things from our small garden. The Strawberry Syrup looks Yummy and I bet it would be good over vanilla ice cream as well. I will be canning some of this up for sure.